Kelvin Thompson still hadn’t recovered from Hurricane Matthew in 2016 when Hurricane Florence turned his life upside down again a couple weeks ago. “It’s been painful,” he said Monday after a press conference outside the legislature. 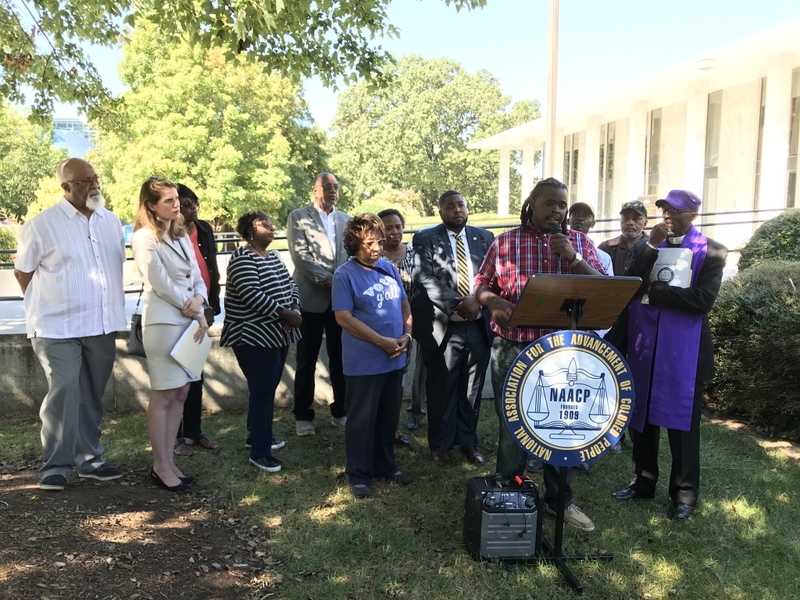 The North Carolina NAACP gathered there the day before lawmakers were scheduled to return to Raleigh for a special session on hurricane recovery. The organization has asked for immediate emergency action of the release of hurricane relief resources to the fullest extent possible and for the state to take measures to ensure those affected by the recent natural disaster would still be able to partake in the midterm elections. Thompson is one of those people. He and his family are staying with relatives now, but they were recently in a Lumberton shelter. His home flooded in 2016 and hadn’t yet been repaired and his car flooded during Hurricane Florence — now he has to find rides everywhere, including to the community college classes he takes. He asked lawmakers to consider impacted-communities’ needs. “There are a lot of people who don’t have the necessities they need,” he said. The NAACP has officially asked the Governor, lawmakers and the State Board of Elections and Ethics Enforcement in three different letters to extend the voter registration deadline by at least three business days in the affected counties — Beaufort, Bladen, Brunswick, Carteret, Columbus, Craven, Cumberland, Duplin, Greene, Harnett, Hoke, Hyde, Johnston, Jones, Lee, Lenoir, Montgomery, Moore, New Hanover, Onslow, Pamlico, Pender, Pitt, Richmond, Robeson, Sampson, Scotland, Wayne and Wilson. The organization has also asked to extend the absentee ballot deadline for hurricane-impacted counties to 5 p.m. the day prior to Election Day and to allow local churches and community organizations to assist hurricane-impacted voters in obtaining, preparing and submitting absentee ballots. And finally, they have asked for early voting and Election Day accommodations for certain communities. Spearman expressed some skepticism about lawmakers’ motives, noting that they have previously implemented deceptive plans and that the NAACP would be back for the special session tomorrow to keep a watchful eye on the public’s business. Rep. David Lewis (R-Harnett) tweeted today that his office supported extending voter registration until Oct. 15 in impacted areas, funding additional voter education efforts for displaced individuals and allowing quick replacement of damaged voting sites. Caitlin Swain, co-director of Forward Justice, said at the Monday press conference that they want to take the worry about voting access off the table for people who are focused on recovering from the hurricane. She said at least 1,200 voters have been displaced and are not in their homes after the storm. “What we have asked for is simple accommodations that will allow for voters to know that when early voting begins and when Election Day comes around, your voice will be heard, and that voice is essential for being able to ensure that the recovery efforts themselves serve the people who are most impacted in these communities,” she said. Sylvia Barnes, president of the Goldsboro/Wayne county chapters, spoke at the conference about some of the impacts in her area — she said roads were still closed from flooding damage and two shelters had to be closed because of damage. “You cannot imagine unless you have been in one of these areas what the devastation is and how people feel so lost,” she said. The House and Senate are scheduled to convene at 10 a.m. tomorrow, and a joint appropriations meeting is set for 11 a.m. Read the NAACP’s full request below.